The role of a coach is to guide athletes and teams to their peak performance through physical and mental preparation in training and implementing that training in competition. At this mission’s core must be a plan, and in college or high school running, this plan is important to the success of the student-athlete in the classroom and on the field of play. The typical running year involves four seasons: cross country, indoor track, outdoor track and the offseason (summer). For distance runners this would constitute the longest competition season of any collegiate athletes. Without proper planning and monitoring of a student-athlete’s training load, life’s other stresses, such as classes, social life and campus activities can contribute to overtraining and failure to reach goals. For this reason I consider planning duties the most important aspect of a coach’s responsibilities. I use TrainingPeaks with my student-athletes because of the powerful data gathering tools and the ease of delivery. Athletes can check training schedules and plans from their phones in-between classes or from laptops in the library. From my perspective, I can access my coach account easily during workouts or while I am out of the office to review schedule conflicts, injury impacts or weather conditions that may require adjusting the plan. 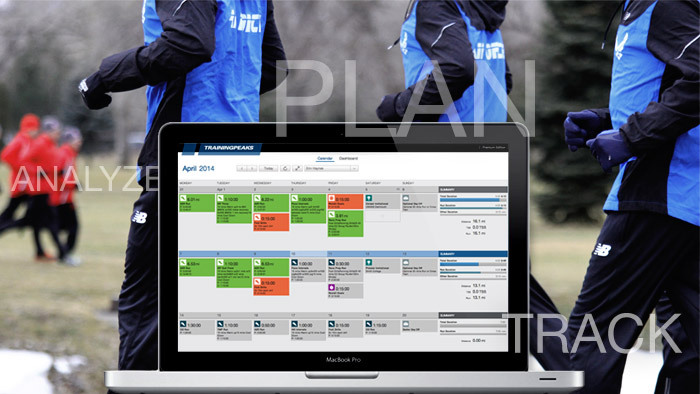 The first determining factor in creating a seasonal plan is loading the season’s competition schedule into the TrainingPeaks calendar. I begin by breaking down the schedule into predictable events that are important year-in and year-out. An example of the competition schedule for college cross country would be pre-conference meet, pre-regional meet, home meet and the conference and regional championship meets. Depending on the past level of performance, I may swap the pre-conference meet for the pre-national meet. Building the season around these meets insures that athletes are prepared for the course conditions when they compete at their peak events. The wonderful part of cross country is that the weather can create completely different circumstances on race day and we cannot plan for those circumstances, but preparedness in other areas will minimize the impact. The next step in planning a season is having goal mapping meetings during the preseason. During those sessions I guide the student-athletes through exercises to determine three key motivations: why they run, what race they want to perform their best at, and how they believe they can best prepare for that peak performance. The best plans and most effective training will be pointless if the student-athletes do not believe in the mission or goal themselves. That is why their buy-in is so important to the planning process. This past season, my men’s and women’s teams were at different levels of development, and their team goals reflected it. The men focused on the conference championships, while the women chose the NCAA Regionals. Their respective training plans reflected the different preparation during the tapering phase. I used the Weekly Goals feature in TrainingPeaks to remind my student-athletes about the seasonal goals, or training goals that we are focusing on that week. When I prepare my seasonal, I share it freely with the student athletes who are interested and always comment that the plan in “written in pencil” and will be evaluated and altered based on workout data, race performances and sometimes my inspiration. My staff and I collect workout data from heart rate monitors, GPS watches, and smartphones, which are uploaded to TrainingPeaks for review with the student-athlete and staff. Student-athletes are excited to get direct feedback on their individual performances and it allows me to personalize the workouts, especially recovery days. Having the ability to gauge recovery through data collection means I can prepare my student-athletes to perform their best during team workouts, during which they can push each other and better simulate race situations. Compared to collecting written training logs and Excel spreadsheets to review summer training sessions, I simply log into my coach account and scroll through the athletes accounts getting information from their dashboard. As my team grows in size the use of Training Peaks has become an essential management tool with the added benefit of distributing training times and locations. When athletes have class commitments that preclude them from attending a practice session they can review the training and then upload their data for review so their preparation is continued with their teammates. I have also found that using the share option to display the workout on Facebook and Twitter is a great recruiting tool for our program. I have recruits who will be joining the program in the fall already asking me when they will get their TrainingPeaks account setup so they can begin to log their training. Cross Country is the collegiate sport that requires the most basic equipment, just shoes, shorts and a singlet, but with TrainingPeaks I can combine multiple technologies to create interest by my team, improve my coaching and encourage better performances in one easy to access software. Learn how the TrainingPeaks Team Sports Program can help you succeed. Nick Radkewich is currently the Head Men's and Women's Cross Country and Track & Field Coach at Belmont Abbey College and coaching triathletes of all levels. Nick was named the World Triathlon Series Final-U.S. Elite Team Coach in 2012 and is certified as both a USA Track & Field and USA Triathlon Coach. As a runner, Nick was a two-time Foot Locker Cross Country Finalist and a member of the University of Notre Dame Cross Country and Track teams. After graduating, he competed as an elite triathlete competing in six world championships, two Goodwill Games and the 2000 Olympic Games, being named USA Triathlon and U.S. Olympic Committee Triathlete of the Year in 1998.